At Intercom our product marketing team has been evaluating a tactic called comparative marketing. The goal: help prospective customers answer the question of how Intercom is different than our competitors. Although this seems straightforward, there is more to successful comparative marketing than meets the eye. At the Inside Intercom World Tour in Boston, I explained what led to our decision to pursue this strategy and shared some research about what makes this work, as well as five things you should consider when doing comparative marketing at your company. You’ve probably heard that great products sell themselves. This is a myth. You’ve probably heard that great products sell themselves. This is a myth. It’s not hard to find examples of better products losing to better marketing strategies. Take a look at the format wars between Betamax and VHS, or more recently between HD DVD and Blu-ray, and you can see that having a better product doesn’t guarantee you will come out on top. You need more than just a great product to win, and your marketing efforts can play a big role in your success, or lack thereof. At Intercom, marketing has a broad range of responsibilities spanning the customer lifecycle. Our marketing efforts begin at creating initial product awareness then continue all the way to retaining and delighting our customers. As product marketers, our role is to help convince people to buy our products by clearly showing how they can be hired for a Job-to-be-Done. For the past four years this has been our core focus. Our commitment to continuously improving the clarity of our positioning is one of the factors that has helped drive our significant growth. But company growth creates new challenges. One interesting result of our increased brand awareness is a shift in the questions prospects are asking us. We get fewer people wondering what Intercom is or our how our products work, and more folks interested in how we compare to specific competitors. As a product marketing team our job is to provide prospective customers with the information to answer these questions. This led us to evaluate and create comparative marketing assets. Essentially comparative marketing is publicly comparing your product to your competitor’s product with the intention of convincing buyers to pick you over them. This tactic can be used to influence a buying decision when someone is either hiring a product for the first time or evaluating a switch from their existing solution. According to Persuasive Advertising by Professor J. Scott Armstrong at Wharton, a meta analysis of 77 empirical studies on the effects of comparative advertising found that this tactic increased a buyer’s intent to purchase a product by 22% on average. 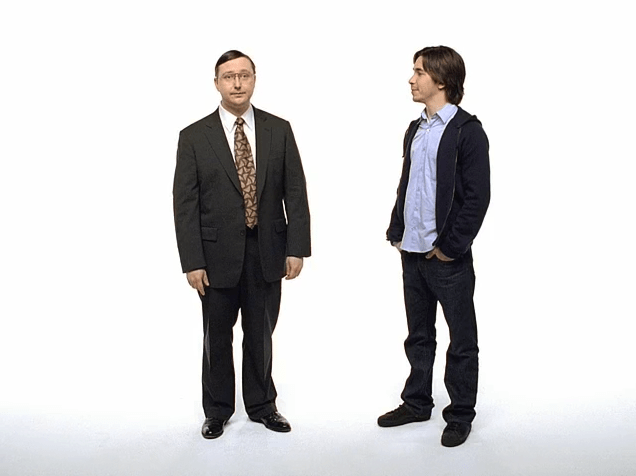 The best recent example of the impact of comparative marketing comes from Apple’s “Get a Mac” campaign, which ran from 2006 to 2009. When Apple launched this campaign their computer sales were on the decline and Macs were getting outsold roughly 60 to 1 by PCs. Then Apple launched “Get a Mac”. 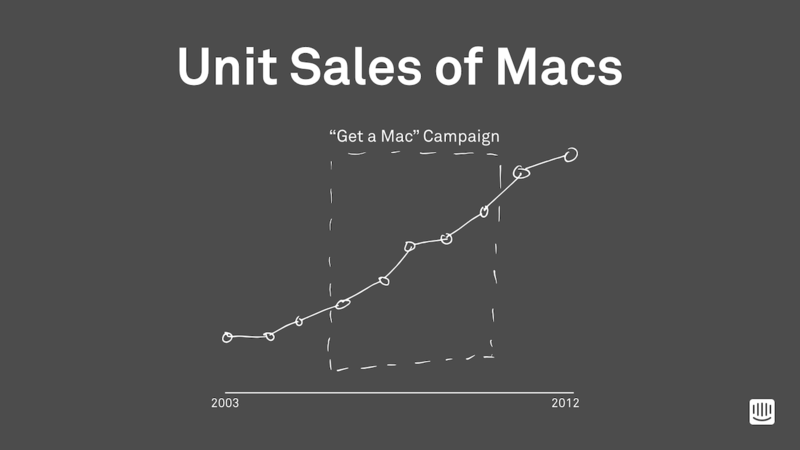 In the first month of the campaign they sold 200,000 more Macs than the previous month. They ended 2006 with a 39% increase in sales. Adweek named “Get a Mac” the best campaign of the decade. Apple has been eating away at PC’s market share ever since. Another interesting thing about comparative marketing is how commonly it’s used to influence customers’ purchasing decisions outside of software. Literally every day you are exposed to this tactic. SaaS has started employing this strategy too, but not very effectively. Why is SaaS bad at comparative marketing? 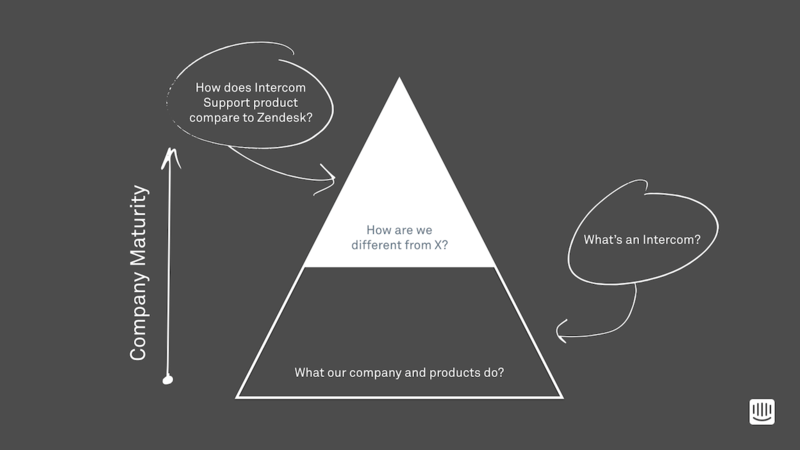 When evaluating how Intercom should approach comparative marketing we looked to our peers in the SaaS industry for inspiration. However, there was little to be found. I went to dozens of different comparative marketing landing pages and found some version of the image above. Everyone seems to follow the same broken template for creating these pages: create a grid, write down all your features, figure out which features your competitor doesn’t have, fudge things to make it look better, and then hand the list to your web developer with the instructions to make the check marks green and Xs red. Do you really expect prospects to be compelled to buy based on a glorified spreadsheet? Features alone won’t give most people a clear reason to buy one product over another. This approach lacks honesty and fails to create any emotional response for the reader. 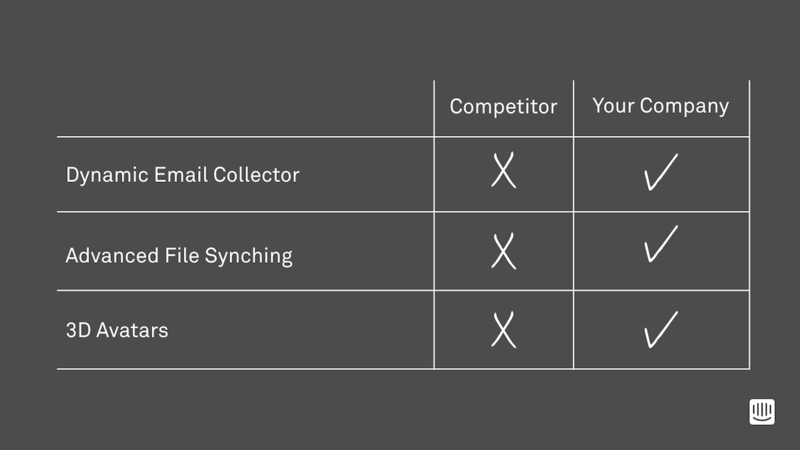 In many instances I would go to the competitor’s page after viewing one of these comparison tables and find a very similar feature, like the email collector shown above. The explanation for this is either a) the company lacks integrity (knowingly using proprietary feature names to make their product appear different when it isn’t) or b) laziness (it was true at one point, but they haven’t updated the page to reflect the present circumstances). It’s bad either way, but still not the worst part of a feature-grid comparison. CEB and Google partnered on a study that found only 14% of B2B buyers see a clear difference when comparing similar B2B products and value that difference enough to pay for it. Basically, features alone won’t give most people a clear reason to buy one product over another. The same study also found that 68% of B2B customers would pay more for something they found personal value in. The take away is that how a product makes a buyer feel impacts the purchase decision. 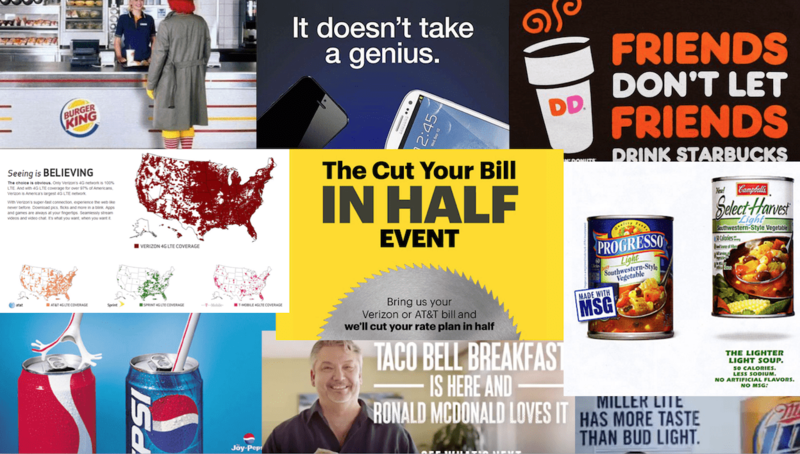 With this knowledge, clearly comparative marketing requires more than a feature grid. How do you do comparative marketing well? So how do you do it effectively? Here’s how. Remember the stat from earlier about comparative ads increasing buyer intent to purchase a product by 22%? Well there is second very important aspect of this finding. Professor Armstrong found that persuasive ads only increase a buyer’s intent to purchase when smaller or newer companies compare themselves against clear market leaders. 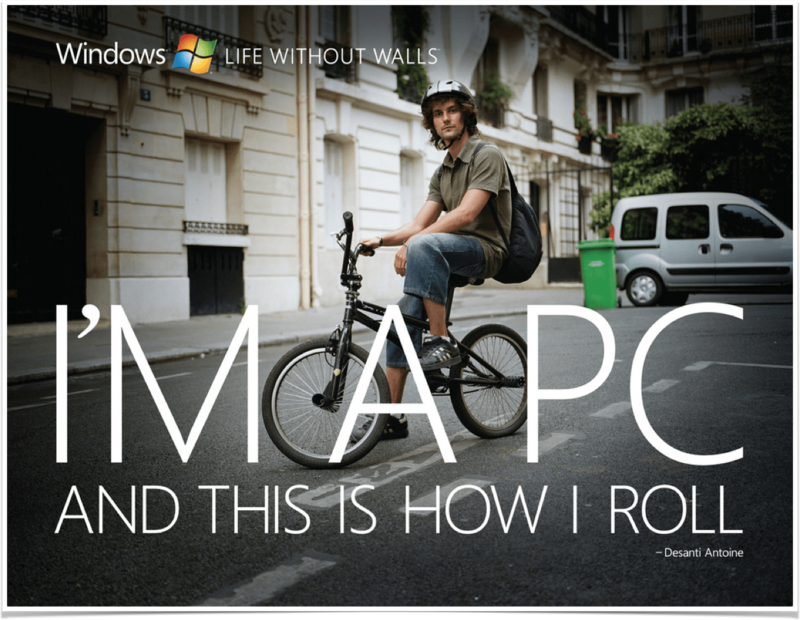 Do you remember Microsoft’s $300M “I’m a PC” campaign shown above? Probably not, because comparative marketing doesn’t have a positive impact when big companies go after smaller ones. I firmly believe that for a customer to give you their hard-earned cash they are going to need to see what it is they are buying. Images and visuals are superior to lists at creating the emotional connection critical to the buying process. Research shows that 65% of all people are visual learners, so images resonate better than words. As humans our visual memory is encoded in the medial temporal lobe of the brain, the same place where emotions are processed. Imagery and feelings are tied together at a physiological level. A good story should provide your audience with the key bits of information they need to form an accurate judgement about your product and it’s ability to solve their Job-to-be-Done. But information alone is not enough. You need to evoke empathy. Paul Zak, a professor at Claremont McKenna College, found stories that evoke empathy cause the brain to synthesize Oxytocin, which has been shown to increase voluntary cooperation. Or put another way, empathy paves the way for a deeper emotional connection that leads to behavior change. In this case that means buying your product instead of someone else’s. This may seem obvious, but for your story to be impactful people need to read it. In addition to having compelling imagery you need to create tension that will hold their interest. An effective way to do that is to show people that your competitor is the “old way” and reveal your solution as “the new way” or the path to a better tomorrow. Setting up a conflict that resonates with your audience’s pain and showing you offer a solution to that pain gives you a better chance of holding their attention and influencing their decision to purchase your product. 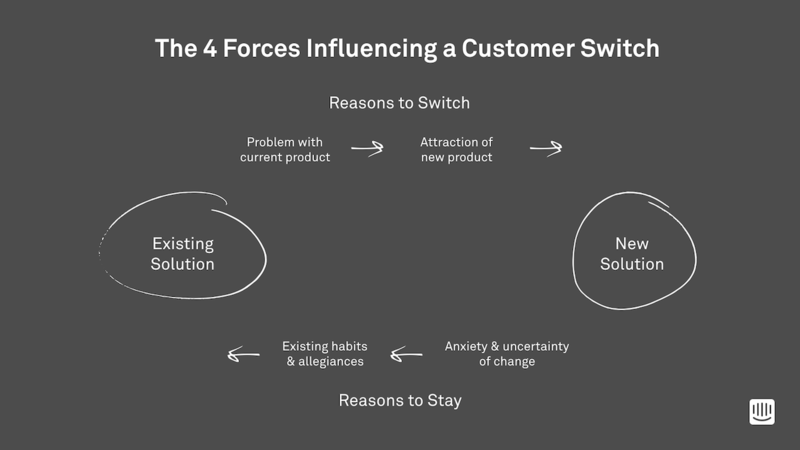 The ReWired Group, a group of leading Jobs-to-be-Done practitioners, identified 4 Forces at play that influence a customer’s decision to switch products. There are two forces pulling prospective customers to your product and two pushing them away. These 4 Forces need to be top of mind when doing comparative marketing because you can manipulate them to lead people to purchase your product and defeat the power of inertia. Here are a few implementation examples. 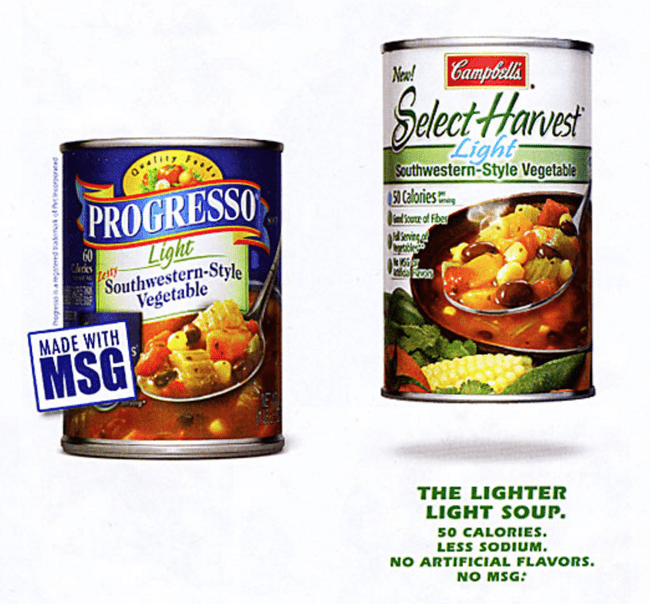 In this example Campbell’s highlights that Progresso uses MSG. It makes choosing Campbell’s a no brainer. When presented with two choices of the same variety of soup a consumer will pick the product that doesn’t use ingredients said to cause various health problems, such as headaches, allergic reactions and infantile obesity. This is crucial. 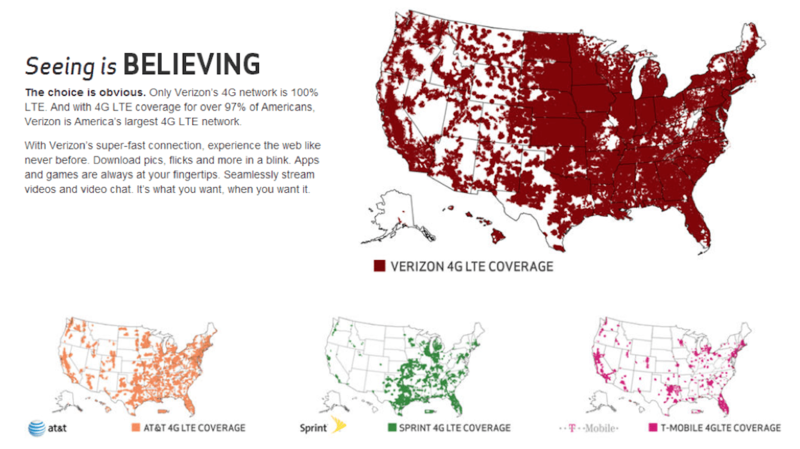 Verizon understands that speed and connectivity are key features of wireless plans. Even at a glance it is obvious that if you want reliable, fast coverage wherever you are Verizon is clearly the choice for you. Here T-mobile focuses on another important feature of a wireless plan, cost. T-Mobile gives price-sensitive prospects a great reason to dump AT&T, Sprint and Verizon. 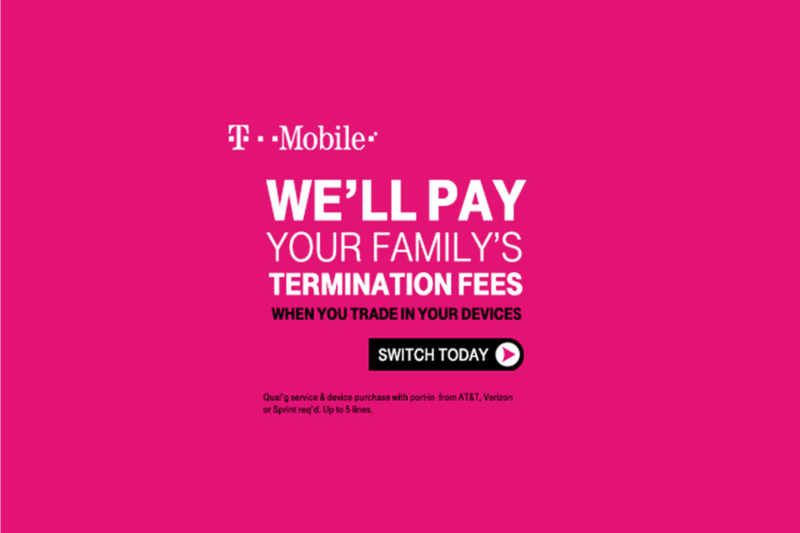 Just bring in your old devices, and they will pay the termination fees for your whole family. Switching operating systems and buying a more expensive computer isn’t a small ask. Apple has convinced people to do this by characterizing PC users as total buffoons. Nobody wants to be identified as a someone stubbornly using an inferior product. The desire to be cool and smart was an effective way of reducing customers attachment to what was familiar, a PC. So far we’ve been happy with the impact of our comparative marketing pages. You can check them out here and here. Across the pages that are live today we are converting >2% of visitors. They are ranking well in search – appearing on the first page of Google results for their respective keywords – and building awareness for our products amongst a new audience. These pages are also having a dramatic impact on the quality score for our paid ads, reducing our cost per click by 3x.